Two framed photographs - one of Jason Crump and the other Carl Foggarty - went up for auction at the 'Cases' Rebels Presentation evening last Friday, raising funds for the SREF. 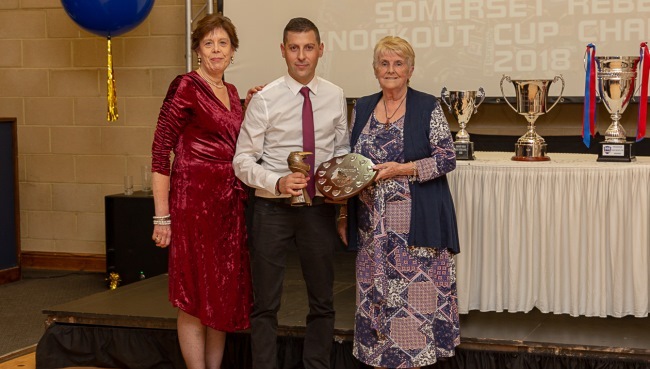 With bidding boisterous the combined proceeds of the lots, generously donated by long-standing Rebels fan Arthur Taylor raised £150 for the support wing of Somerset Speedway, which raises funds for the riders throughout the season. Arthur has found himself in the position of 'downsizing' as he faces the prospect of going into a retirement home and his love for the Rebels and a chance to help the funds of the SREF seemed an obvious match. It was a gesture that warmed the heart of club promoter Debbie Hancock who said "Arthur loves his speedway and the Rebels and for him to put these pictures up for auction was a splendid gesture and I was delighted to see them raise such a significant sum of money, which I know the SREF team of Diane,Roy and Anita will put to good use in the future." The SREF committee nominated Rebels reserve Nico Covatti as their Rider of the Season with Di explaining the selection "we felt that since joining the club Nico has done everything that Garry May had asked of him and it was clear to see that Nico had put Somerset top of his commitments and that is what we like."